In contrast to reinforced concrete, the design of prestressed concrete members is initially based upon the flexural behavior at working load conditions. The ultimate strength of all members in bending, shear and torsion is then checked, after the limit states of serviceability have been satisfied. The prime function of prestressing is to ensure that only limited tensile stresses occur in the concrete under all conditions within the working range of loads. To satisfy the limit state of cracking it is necessary to satisfy the stress limitations for the outermost fibers of a section. Total Prestress Losses: If the initial prestress force applied to a member is Pi, then the effective prestress force at transfers is aPi, while that at service load is bPi. The value of a reflects the short-term losses due to elastic shortening, anchorage draw-in and friction.Total loss coefficient b accounts for the short term and long-term time-dependent losses due to concrete shrinkage and creep and steel relaxation. Magnel Diagram The relationship between 1/Pi and e are linear and if plotted graphically, they provide a useful means of determining appropriate values of Piand e. These diagrams were first introduced by a Belgian engineer, Magnel and hence the name Magnel Diagram. Once the prestress force has been chosen based on the most critical section, it is possible to find the limits of the eccentricity e at sections elsewhere along the member. An allowable cable zone is produced within which the profile may take any shape. The term ‘cable’ is used to denote the resultant of all the individual tendons. As long as the ‘cable’ lies within the zone, the stresses at the different loading stages will not exceed the allowable values, even though some of the tendons might physically lie outside the cable zone. The shear resistance of prestressed concrete members at the ultimate limit state is dependent on whether or not the section in the region of greatest shear force has cracked. The mode of failure is different for the two cases. 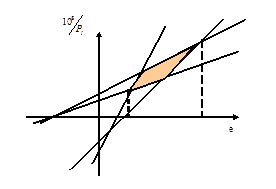 If the section is uncracked in flexure, then failure in shear is initiated by cracks which form in the webs of I or T sections once the principal tensile strength has been exceeded. If the section is cracked, then failure is initiated by cracks on the tension face of the member extending into the compression zone, in a similar manner to the shear mode for reinforced concrete members. There are 2 problems associated with end-block design namely, the assessment of the bursting tensile stresses and the compressive bearing stresses directly beneath the bearing plate. For post-tensioned members, the prestressing force in a tendon is applied through the anchorages as a concentrated force. By St. Venant’s principle, the stress distribution in a member is reasonably uniform away from the anchorage but in the region of the anchorage itself the stress distribution is complex. Many applications of prestressed concrete involve the combination of precast prestressed concrete beams and in-situ reinforced concrete slab. A common example is the in-situ infill between precast bridge beams. The beams are designed to act alone under their own weights plus the weight of the wet concrete of the slab. Once the concrete in the slab has hardened, provided that there is adequate horizontal shear connection between the slab and beam, they behave as a composite section under service load. The beam acts as permanent formwork for the slab, which provides the compression flange of the composite section. The section size of the beam can thus be kept to a minimum, since a compression flange is only required at the soffit at transfer. This leads to the use of inverted T sections. Complete topic is covered in the form of a PowerPoint presentation embedded below along with the solved example on post-tensioned Concrete Slab Bridge.